I must admit, I’m a little bit tired today. I stayed up a tad bit too late working on these three little paintings; but it was worth it! A couple cups of coffee, a bowl of the best ice cream ever (tiramisu by blue bell) a few snuggle breaks with my restless babies, and voila! 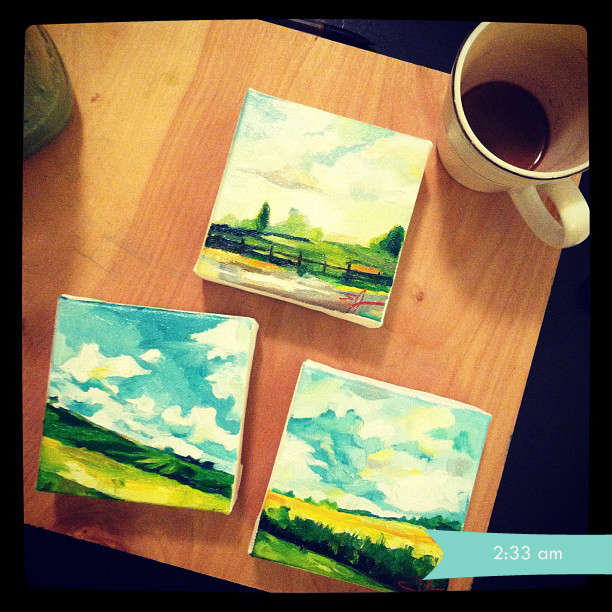 Three small landscapes are born. Remember the painting I did a few days ago, “Nearing 14367“? As I hope you can tell, these paintings are a set. Again, I painted the area around my parent’s home in NW Ohio. I used a huge array of blues and greens and creams. They skies in Findlay are so clear and vibrant. I wanted to capture that in these paintings. More photos of the individual paintings coming soon! I’m waiting on the lighting in my home to cooperate. I’m in Texas, and for once, the sun isn’t shining very brightly. Crazy! Don’t worry, I have no doubt at all that that will change within the hour.